In an era of rapid change and increasing competition, organizations need a smarter infrastructure that is agile, flexible, and resilient. IBM Spectrum Conductor™ delivers those capabilities with robust features that enable organizations to store, analyze, and protect their data with optimum efficiency. IBM Spectrum Conductor is the next evolution of IBM® software-defined infrastructure technology. It is an integrated application and data-optimized platform that enables organizations to achieve up to 60% faster results with new generation, cloud-native applications and open source frameworks. The product achieves these results by efficiently analyzing, accessing, and protecting data. What is IBM Spectrum Conductor? What is IBM Spectrum Conductor with Spark? 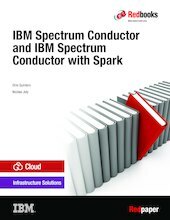 Why IBM Spectrum Conductor with Spark?